PTE EDWD SHEDDEN 15TH H.L.I. 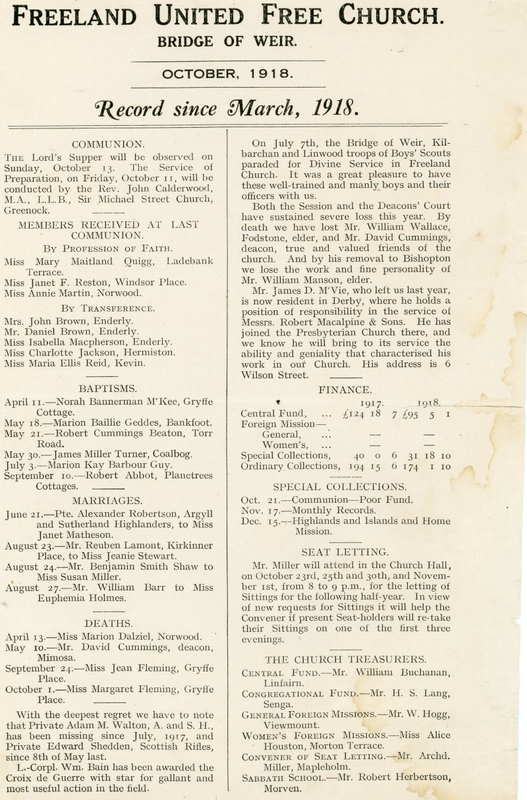 Edward Shedden was born on 6th April 1890 at 162 Boden Street, Bridgeton, Glasgow, the son of Robert Shedden, a journeyman currier from Kilmarnock, and Emily Kelly from Greenock, who had married in Greenock East on 26th April 1879. In 1881 Robert (22), Emily (21), and their 11 month old son Robert were living in 1 McLean's Land, Port Glasgow Road, East Greenock. Robert's brother William (19), a general labourer from Newton Stewart, Wigtownshire, was living with them. In 1891 the Shedden family of six, including Edward (1), was living at 70 Bernard Street, Bridgeton, Glasgow. In 1901 the Shedden family, now of eight, was living in 159 Avenue Street, Newlands, Glasgow. William (16) was an apprentice blacksmith and James (14) a millworker. Robert junior was no longer in the family home. In 1911 Robert, by then a widower, was living in a two roomed tenement flat in Gryffe Place, Main Street, Bridge of Weir with six of his family. James was now a cartwright, Edward (20) a golf club maker, John a tanner, Jane tended the home, and the two youngest boys were at school. William was no longer in the family home. Robert was still employed by the Bridge of Weir tannery in 1917 as a hand setter (by then living in Maxwell Terrace). By 1914 Edward was living in 1 Windsor Place, and was a professional golfer at Ralston Golf Club, having been assistant professional at Old Ranfurly Golf Club, Bridge of Weir between 1905 and 1907. He had been fourth in the Glasgow & District Professional Golf Association Championship in 1910, runner-up in the Autumn Competition in 1911 and winner in 1913 at Cochran Castle. He entered the 1914 Open Championship. Edward volunteered in November 1914 and was enlisted into the 10th Battalion of the Highland Light Infantry (Service no. 1035). He first entered the theatre of war in France on 23rd November 1915. At some time during his army service he transferred to the 1st Battalion of the Cameronians (Scottish Rifles) 19th Brigade, 33rd Division. Edward fought in the Battle of the Somme and on 15th July 1916 was shot and wounded in the right arm. He returned to active service. His death occurred on 8th May 1918 in a counter-attack mounted after an enemy attack on the front lines. His name is recorded on the Tyne Cot Memorial, alongside 35,000 other officers and men whose graves are not known. His medal index card simply states "missing". Edward Shedden birth certificate 6th April 1890. Regd. Bridgeton, Glasgow 28th April 1890. 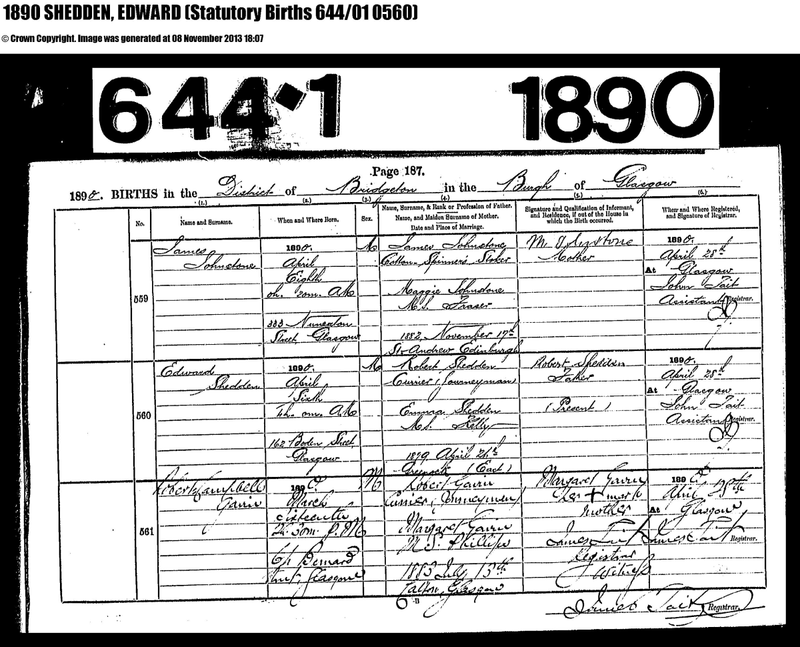 1881 UK Census: Parish: Greenock East; ED:25; Page:24;Line:3; Roll: cssct1881_165. 1891 UK Census: Parish: Glasgow Barony; ED:66; Page:16; Line:4; Roll: CSSCT1891_241. 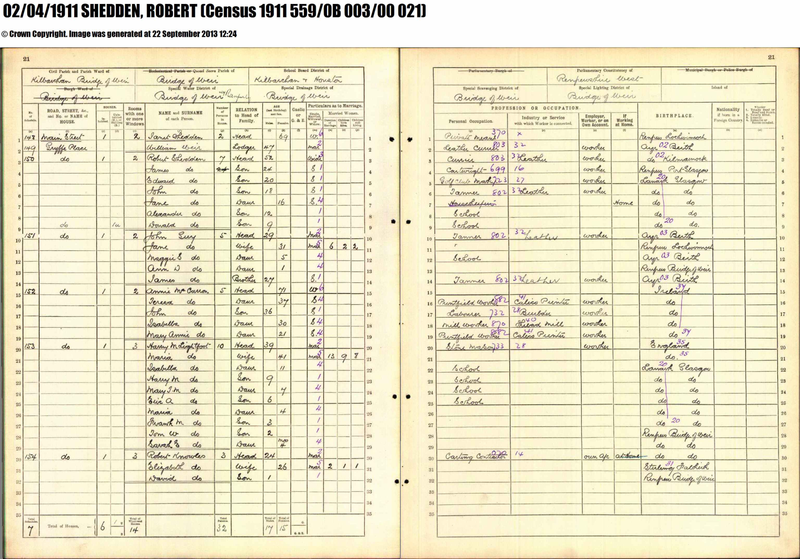 1901 UK Census: Parish: Glasgow Newlands; ED:47; Page:7; Line:20; Roll: CSSCT1901_270. 1911 UK Census: Parish: Kilbarchan; Ward: Bridge of Weir. Page 21. Lines 3 to 9. 559/0B 003/00 021. 15th July 1916: Edward Shedden, Pro at Ralston Golf Club wounded in the Battle of the Somme. Shot in right arm between elbow and shoulder. 8th May 1920: - In loving memory of Private Edward Shedden, 1st Cameronians (Scottish Rifles) reported wounded and missing on 8th May 1918, presumed to have died on or since that date - To memory ever dear - Inserted by Robert Shedden and family, Maxwell Terrace and Commercial Buildings, Bridge of Weir. Freeland United Free Church. Record Since March, 1918. pub. October 1918.
o	Deaths: With the deepest regret we have to note that Private Adam M. Walton, A. and S. H., has been missing since July, 1917, and Private Edward Shedden, Scottish Rifles, since 8th of May last. 8th May 1918. ATLANTIC CAMP. Enemy attacked the trench and 33rd Divl Front at 8am after the French had made their attack & drove the line back. Message received at about 9.30am that situation on 30th Composite's Bde front was obscure & that the Bn was to take up a position in the VLAMERTINGHE LINE between HALLEBAST CORNER and a point 600x NE of HALLEBAST CORNER & would be prepared to make a deliberate counterattack if necessary. The Bn then moved forward via BUSSEBOOM & GOODMOET MILL. C Company with orders to take up a position from HALLEBAST CORNER to a point in the VLAMERTINGHE LINE 300x NNE of "C" Coy's left & D company a support position 300x in rear of B&C Coys. The Coys took up positions about 1.30pm. Bn HQ moved forward to a dugout in the railway 400x south of OUDERDOM. The Commanding Officer and Intelligence Officer went forward at 12 noon to reconnoitre the positions in the VLAMERTINGHE LINE. A Coy remained in former position in the switch line near OUDERDON. At 12.30 Bn HQ moved forward again to a farm 600x NNW of St HABERTH HOEK. At 3.30pm orders were received for the attack. The Bn was to attack on the right. The 5th Scottish Rifles on the left. The attack was to take place in conjunction with 98th Bde who were attacking on the left. The Bn was to form up near HALLEBAST CROSS Roads & advance with the left Flank on the HALLEBAST-VIERSTRAAT Rd on the right. Touch was to be kept with the French who were attacking at the same time. The Bn was to cross the ROZEN HILL BECK at 7pm & on account of the extent of the advance the Barrage was to continue until 7.15pm. The objective was the old front line system which had been taken by the enemy that morning. At 3.45 orders were given that the commanding officer would greet company commanders at HALLEBAST CROSSRoads at 5.15pm & that Coys were to be formed up in their present positions at that time ready to move off immediately verbal orders were issued by the commanding officer. A Coy was given written orders to move forward at once to HALLEBAST CORNER where further orders would be issued. At 5.15 the commanding officer met O.C.s of B, C and D Coys & explained the situation & gave orders for them to form up on a small track south of HALLEBAST crossroads ready to move forward at 6pm. B Coy was to advance on right & C Coy on the left with its left on the HALLEBAST-VIERSTRAAT road. D Coy was to advance 460 yds in rear of B & C Coys. On moving forward Coys were to advance in Artillery formation. At 6pm B, C & D Coys took up their position & advanced in artillery formation. As soon as they had got clear of their forming up position a hurricane bombardment was put down on HALLEBAST CORNER which inflicted a few casualties on A Coy who had just arrived. The commanding officer then gave Capt Wightwick (OC A Coy) to move forward in rear of D Coy which he did. As soon as the leading companies reached the ridge North-west of the ROZEN HILL BECK a heavy barrage of machine gun fire opened. A certain amount of artillery fire opened but a proper barrage was not put down until A Coy reached the ridge. Very few casualties were inflicted by shell fire but very heavy casualties occured through machine gun fire. The company commanders of A, B & C Coys were wounded almost immediately. In the advance B & C Coys lost direction & went over to the right leaving a gap of about 700x on the left between the left flank of the Bn & the right of the 5th Scottish Rifles. Elements of the leading companies got well across the ROZEN-HILL BECK but owing to very heavy casualties from M.G. fire while crossing the stream were not able to hold on to their position. At about 9pm the same night a position was consolidated west of the ROZEN HILL BECK with 5 Lewis guns on the far side of the stream. On the left, as touch could not be gained with the 5th Scottish Rifles, a defensive flank was formed on the left which was covered by 4 Lewis gun posts. The ground was very marshy and formed a formidable obstacle. o Shedden, E.: Private: 35692: 1st Battalion: France 8/5/18: Glasgow. The Thirty-Third Division in France and Flanders 1915-1919. G Seton Hutchinson. For more than a week the rain fell in torrents, filling the streams to such an extent that many of the guns and ammunition dumps were under water. On the 8th of May, at 3.30 a.m., a very heavy enemy bombardment began, particularly with high explosive and gas. At 5.30 a.m. the 98th Brigade captured some prisoners who stated it was the intention of the enemy to attack at 7.30 a.m. that morning. At the same time, General Daydrein's 32nd Division counter-attacked on our right. The French did not, apparently, get very far, and the Boche, in a further counter-attack, succeeded in effecting a lodgement behind the French left and our right, where lay the 30th Composite Brigade. At 10 a.m. the 19th Brigade reached the Vlamartinghe line to restore the situation. At the same time, the right of the Argyll and Sutherland Highlanders, under Major Colquhoun, which Regiment had fought with the greatest heroism, undergoing a gas bombardment for many hours, were driven back from Ridge Wood into the Western side of Scottish Wood, whilst the enemy succeeded in driving a wedge between the Cameronians and the former Regiment. On the right of the Cameronians, in the 30th Composite Brigade, only a few remaining men of the 2nd Bedfordshire Regiment, who had been continually in action for many days, held out. The remainder of the Brigade was thrown back and intermixed with the Cameronians, whose commanding Officer, Lieutenant-Colonel Draffin was captured. Into this breach the Argyll and Sutherland Highlanders were rushed forward with a section of the Machine Gun Corps, and not only inflicted heavy casualties on the enemy but effectively checked his advance. The Cameronians, in particular, had suffered very heavy casualties - for a time their whereabouts was a complete mystery - as had also the French on the right of the 33rd Division. Medals: Victory, British War, 1915 Star.